New Pet? Accidents are bound to happen! Even with a house trained pet, your carpets and upholstery are subject to addition abuse and unpleasant odor. 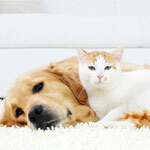 We use a complete cleaning process to ensure pet stains are kept to a minimum and the pet odor is reduced or elimated. The sooner a pet stain is treated, the better the chances of avoiding permanent stains and odor. With a urine stain, it is extremely important to not allow the stain to set into the multiple layers of your carpeting. With certain types of carpet fibers the urine can cause permanent dye structure damage that cannot be repaired. Although we cannot guarantee that every pet stain and pet odor can be removed, we use the most effective techniques available to professional carpet cleaners.